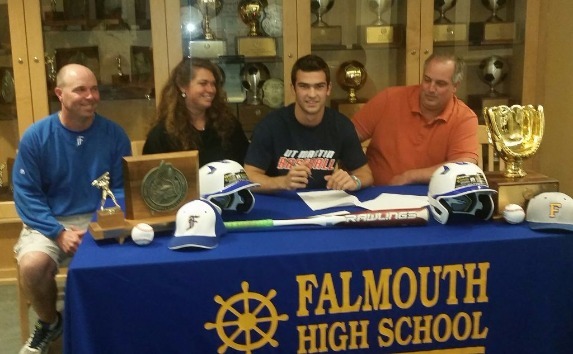 ​Falmouth senior Connor Aube, joined by his coach, Kevin Winship, left, mother, Carrie, and father, Craig, signs his National Letter of Intent Thursday to attend and play baseball at the University of Tennessee-Martin. The Skyhawks play in the Ohio Valley Conference. 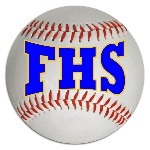 Aube, a centerfielder, who expects to play in the outfield in college, is the third product of the Falmouth baseball team in recent years to play Division I. Matt MacDowell went to Dartmouth and Will D’Agostino is in his sophomore year at Holy Cross. Last spring, Aube hit .412, scored 20 runs, drove in 11 and had 13 stolen bases for the Yachtsmen, who reached the Western A semifinals. For his three-year varsity career, Aube has an average of .430, with 11 doubles and 35 steals. Aube is also a standout running back on Falmouth’s football team, which will play Marshwood for the Class B South title Saturday afternoon.